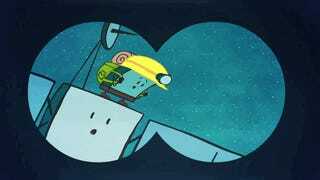 It's Time For Another Episode In Rosetta And Philae's Adventures! It's time for the latest installment in Rosetta and Philae's adorable cartoon series. After insisting the spacecraft wake up, impatiently demanding to know if it was there yet? !, telling stories to pass the time, and finally arriving, it's time to get giddy about Philae's impending landing on a comet. Rosetta, Are We There Yet?! This is our first attempt at gently landing on a comet. Even if everything goes right during the detachment from Rosetta and descending on the comet, the mission still faces challenges. The comet's surface may be so soft the lander has trouble drilling in and security itself, or Philae could get nailed by one of the boulder littering the comet's surface. I'll be locked to the webcast with my fingers crossed hoping this charismatic little robot survives the next stage of its adventures. Excited? You can pick up your own avatars, banners, and wallpapers for the landing here. If you're really excited, the cartoonists for the Rosetta and Philae mission have a webshop with T-shirts. Check the countdown to landing and watch the landing live on the ESA Rosetta website.